Something that I’ve been noticing ever since I began freelance writing is that small business owners seem to struggle with their blogs. They’ll know that they need one, and that it’s allegedly a good way to increase traffic to their websites. So, they hire someone to write a few blog posts, put them up on their new blog page, and wait a year or so for results. When they don’t see them, they get frustrated, thinking they’ve been lied to, and abandon their blogs all together. The reason that these small businesses aren’t seeing results from their content strategies isn’t because they were duped. Content marketing is incredibly effective for lead generation—when it’s done right. In fact, 74% of companies claim that content marketing is increasing their lead quality and quantity. Content and SEO go hand in hand. You may have even heard that marketing cliché “content is king.” It’s true. In part two of this post, I’ll explain how to identify good SEO in your content, and discuss how it works in tandem with good content. However, it doesn’t matter how well-skilled in SEO your content writer is, if he doesn’t understand what constitutes good content, his SEO knowledge is essentially useless. Not all small business owners are going to be adept at writing. That’s okay—that’s not your job. There’s nothing wrong with outsourcing. That being said, you do need to be able to identify what constitutes good content in order to be able to vet your writers, and determine if their submissions need revisions. It might seem like a nuisance, but it’s better to be informed than to throw away money. 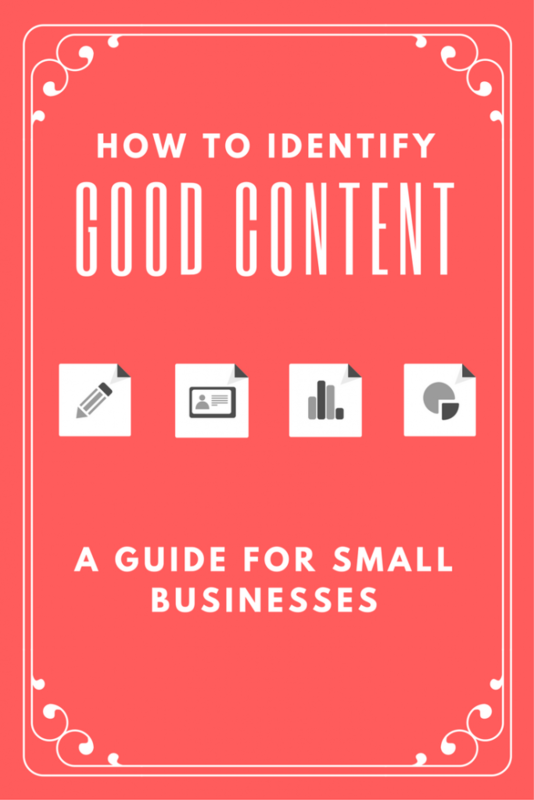 So, how do you determine good content? I’ve elaborated on each of these points down below to give you a little more insight into what each of these entails. Ask Yourself: Is this something that my base clientele would actually want to read? I’ve come across way too many small business blogs that don’t have any content worth reading. They’ll post a 500-word article about how pretty hardwood floors are, but there won’t be a bottom line to the article that gives me an answer to the question: why am I reading this? Does this article on hardwood floors tell me how to get scratches out? Which chemicals are safe to use on it? Which type of wood is best if I have 13 cats? If it doesn’t provide an answer to your target audience’s potential problems, it’s not good content. Maybe you’re providing people a how-to guide on installing wood flooring. Maybe you’re clarifying the difference between ash and maple hardwood. You could even be offering up some hard numbers detailing why installing hardwood floors will make your house easier to sell. Either way, you’re giving your readers a lesson on what you’re the expert in, and backing it up with high-quality sources, or personal testimonials. Notice how I haven’t been hurting your eyeballs with giant blocks of text? Sometimes I even bold sentences in order to draw your attention to really important details. How quickly would you have clicked away had you come in to a one-paragraph wall of words? Even better, I’ve organized each of my check-points for you in bullets so that, if you need to come back to this later for reference, you’ll be able to find them easily. People have poor attention spans, and they want the information fast and easily. Most readers only read 60% of the content in an online article, so you need to make sure you’re giving them easy access to the stuff they came to find. Is your content just a rehashing of the third result on page one of a Google search? Try again. You might think the fact that it’s on page one of Google means it’s proven to be a popular topic for your industry. That’s totally true, but that information is already easily accessible right there on the first page of the search result. No one in their right mind is going to go looking for your post when there’s a more popular one that takes even 5% less effort to discover. Your content writer needs to be to take the information on the third result of a search and apply an interesting twist on it. For example, let’s say lots of people in your industry search for “what flooring is best for humid environments.” On page one of Google, there’s a popular article that argues for wood flooring over carpet. When you google “what happens to carpets in humid environments,” however, little of value comes up. This topic is similar enough to the popular result that you’ll know it’s something people are interested in reading, but it doesn’t have a ton of competition. Everyone else is rehashing that really popular article on hardwood vs. carpet—you’re going to stand out by posting something original. Is there a nice graphic in there that would be compatible with Pinterest? Is this something that you can post on LinkedIn, Twitter, Facebook, or Instagram? Social media’s a good way to get your content in front of more eyeballs, and if it’s not mobile-friendly, or doesn’t have a headline that makes people think “oh! I need to click that!” it’s not good content. The headline is often the first thing that people will see when they come across your post on social media. It needs to be click-worthy. For the love of God, please don’t post poorly-written, typo-ridden, grammar-mistake-filled content on your blog. The best way to avoid this is to hire a good writer from the start. Everyone makes mistakes when writing, and the occasional typo is almost always forgivable to the average reader. When they start to pile up, however, is when people click away. Good writing also means that the content is to the point, and isn’t filled with tons of tangents and bits of information that don’t support the bottom line. This can be tricky to identify, but a simple trick is to ask yourself: “if I took this sentence/word/tidbit out, would this article be better or worse?” If it would be better, take it out. If it would be worse, leave it in. If it doesn’t seem like there would be a difference, take it out. There’s no point bogging down the article with excess junk that doesn’t add value. After reading this, you might be thinking, “Wow, this sounds hard.” It is. You might also be thinking, “Writers who can do all this would be expensive!” Also true. However, content marketing is still cheaper than traditional marketing, and between you and me, it generates 3x more leads. There’s simply no point in wasting money on content that isn’t going to do anything positive to impact your business. If you’re wondering how the quality of your content plays into SEO’s effectiveness, stay-tuned for part two of this post!